Podcasts are so yesterday. They’re old hat. A trend that’s had its day. Dead. Finito. There’s no obvious reason at all why your business should use them. All true? No, absolutely not. While there are some who will tell you podcasts no longer hold much value for a business, there are more who say it’s exactly the opposite. The truth is, podcasts never went away. They’re still here, more than 10 years since they bounced on to scene, and they’re stronger than ever and just keep on growing in popularity. And here’s the rub. The killer fact that will, hopefully, make you think twice: According to Edison Research, more than 75% of people who listen to podcasts will take action based on the host simply asking them to do something. Wowsers! Which is why, if your business doesn’t use podcasts, you may want to sit down, mull it over with a cup of tea/glass of wine, and consider doing something about it. The first thing you’re going to ask is: “How much is this going to cost me?” The answer is: Not a lot. It really doesn’t take a lot to set yourself up to launch your first podcast, and absolutely anyone can do it. You will need a microphone and headphones, both of which can be picked up at a reasonable price (for good-quality products, too), and editing software, which is often free. Once you’ve got that, just press ‘record’ and away you go. And it doesn’t matter where you do it, either. It really is that easy. You could even do it on the loo, although that’s perhaps not advisable. Once you’ve created your podcast, the next step is hosting and distributing. Some platforms will charge, whereas others are free. So you see, when I said “cheap”, I really meant it. Our SEO whizz here at LikeMind Media, Sarah McDowell, has started podcasting and it didn’t cost her a penny. She created SEO SAS for free – all she had to do was sign up. Your final step is to shout about it and promote it, and let your audience know it’s available. Your audience don’t have to do a lot to tap into your content, that’s the beauty of podcasts. 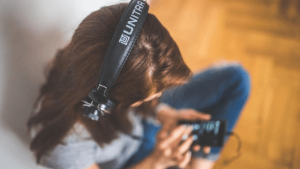 Unlike reading a blog or watching a video, podcasts are more accessible, so users can listen to your content wherever and whenever, such as in the car or at the gym or when they’re whizzing the vacuum cleaner around the living room. How appealing is that? Podcasts are the ideal format for mobile – which is where we consume the majority of our content – because it can be consumed on the go. Your podcast enables you to interact with your listeners in a way in which written content, for example, may not. Written content is everywhere you look. Many of us are staring at it every day. But a podcast offers something a bit different for people to engage with, and many of them will welcome the break from staring at a screen. It also gives you the opportunity to communicate your message. And one more point to consider. A huge number of podcast downloads come from subscribed platforms which automatically download your latest episode when it’s released. So when you publish your podcast on Stitcher or iTunes, you are unveiling your content to thousands of potential listeners – for free. Your podcast is your voice to shout about your brand. The more you broadcast, the more familiar your podcast becomes and the more awareness there is about your business. That sounds ridiculously simple. Because it is. For example, take our very own annual conference MarketEd.Live. This year, we launched our own podcast, cunningly called MarketEd NOT Live. See what we did there? It was the perfect tool to join in with the buzz and excitement ahead of the event; we had early insight from our speakers who appeared on the podcast as guests; and it helped drive ticket sales. All very important and not to be sniffed at. And nor did we sniff. We lapped it up and we loved it. Okay, I’m going to hit you with a stat again. According to a Midroll survey of 300,000 podcast listeners, it was revealed that 63% of people bought something a host had promoted on their show. When asked if advertising within podcasts had affected their behaviour, 71% said they had visited a sponsor’s website, while 62% said they had considered that new product or service. Sounds like a no-brainer, doesn’t it? By sharing your knowledge, your expertise and your enthusiasm for your chosen field, you are speaking with authority and influencing your listeners. People want to trust a brand. They want a company to know what they’re talking about. To fully understand their industry. By regularly sharing your expertise on your podcast, your listeners will come to rely on you. To believe in you. To put their faith in you. 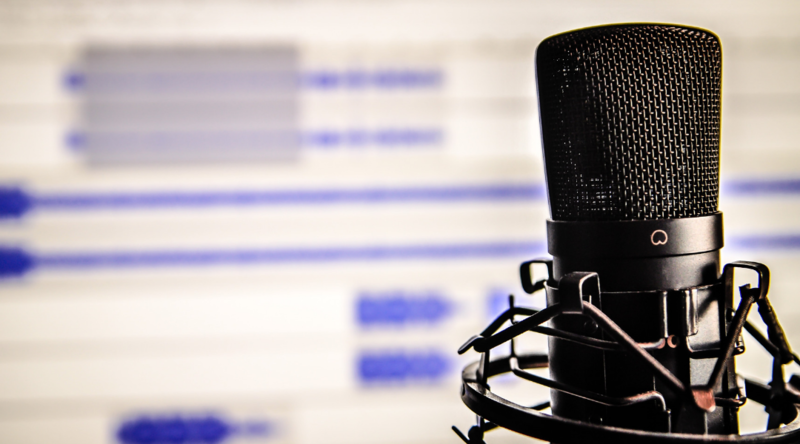 Podcasts are a highly effective way to engage your audience and influence their decisions. Familiarity breeds contentment. That’s right, that’s what I said. Your listeners, by hearing your voice on a regular basis, will begin to feel they know you. That you’re a friend, not a stranger. They will want to be associated with you. With your brand. They will appreciate that personal touch, that they share something in common with you, and it will help them develop a strong bond with you. It will also encourage them to keep coming back to you, because people like what they know. It may also lead them to recommend your podcasts to others, potentially increasing your reach to new listeners. More traffic generation. New customers. Content makes you relevant. It’s how you get the attention of your clients and potential clients. Content marketing is about providing value, earning trust and building relationships. Why, then, have you not already delved into the world of podcasts? Because that’s exactly what they do, and do very well. Try promoting your social media channels and use them as a conversational tool, talk about recent posts on your blog, build your email list. There are so many opportunities available to you in your podcast. Content marketing doesn’t have to be just about your latest blog. It’s how you create various types of content for your potential customers to engage with. Ah yes, added value. In marketing terms, giving your clients or customers something which makes a product more appealing to them. That can mean repeat customers, brand loyalty or choosing your product over your rivals. In podcast terms, the same applies but it’s about understanding your listeners and what is important to them, and therefore giving them something they will view as being valuable. Even if you don’t create your own podcast, think about appearing as a guest on others. This is an effective strategy adopted by LikeMind Media MD Paul Ince (@BizPaul), who not only appears as a regular podcast guest because he enjoys it, but because he can bring added value by talking about the company, the services and products. If you’ve ever been asked to speak in public but can’t quite back yourself to do it because you’re afraid you’ll fluff it in epic style, but deep down inside you’ve always wanted to do it, you might feel differently after you’ve become a regular podcast host. You will hone your communication skills, you will develop skills you never knew you had, you will become at ease behind a microphone, and you’ll love the fact that people are earnestly listening to what you have to say – all in a live environment. You’ll find a style and approach that suits you and, wait for it, a new confidence in speaking. Your podcast can be whatever you want it to be – just make sure you have fun doing it. The more you enjoy it and sharing your stories, the more that will come across to your listeners and the more they will enjoy it. Don’t think of it as a chore, it should be something you look forward to doing. In turn, it will be something your listeners look forward to hearing. It will give you the opportunity to meet and interview guests, and enable you to interact with your listeners. Have fun! If you want to talk to us about podcasts, if you want some more information, please gives us a call on +44(0)1509 228702 or drop us a line here.